Cross country running often conjures up images of harriers passing over hill and dale, through fields and forests and occasionally leaping hay bales or tromping through mud. Some would say this type of running or racing is not for the faint of heart. 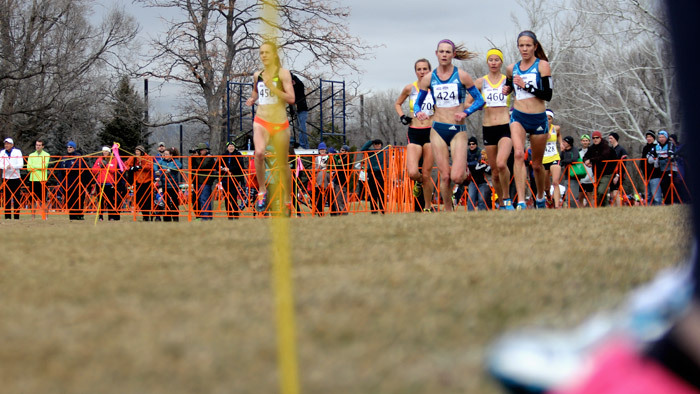 Others will tell you that cross country is where they “fell in love with running.” Whatever the case may be, there are some benefits to exchanging the street and track for the grass and trail. Most of us competitive types like to know how far and how fast we did something. And quite often, there is value in knowing what work has been done. Typically “workouts” are the time and place where the data are scrutinized. But there could be some practical application for removing the structure every once in a while. As we have established, cross country courses look less like the oval at the Indianapolis Motor Speedway and more like a scene from The Lord of the Rings trilogy. Effective training requires putting in some time on varied terrain- think hills, grass, dirty, sharp turns, etc. However, these surfaces can potentially be problematic when trying to execute a workout at a specific speed or pace. In other words, trying to maintain exact 5K pace for 1000 meters on a hilly grass loop may prove difficult. But maintaining 5K effort can be a much more manageable assignment even though the actual pace could vary based on the route topography. At this point you may be asking yourself, “I’m not training for a cross country race, so how can this help me?” It’s a good question and here is a potential answer. Maybe your standard workout venue is on the local bike path. The path is marked every half mile and you take advantage of those markings and do all your workouts in the same place. Well let’s say one day you show up to your spot and you’re dealing with a steady wind that’s going to be at your side or in your face the entire time. Your paces for the measured distance are guaranteed to be slower than assigned because of the conditions. Now is the time to start thinking about an effort based workout. If your assignment was 6 x 800 meters @ 5K pace with equal rest, the easy adjustment would be a fartlek of 6 x 3 minutes @ 5K effort with 2 to 3 minutes of easy jogging in between. Is the pace and distance going to be the same as the original assignment? Probably not, but that’s OK. You are still getting work in and making the most of a non-ideal situation. Along those same lines, a cross country style workout on varied terrain can help relieve some stress from the expectations of certain workouts. For example, maybe you have a hard time executing lactate threshold or extended tempo runs. These types of efforts make you nervous and the workout becomes difficult before it even starts. Again, time to look towards a cross country type workout for a little assistance. Often times you will hear a coach instruct an athlete before running a tough hilly race course to start out controlled and pick it up as the race progresses. This same methodology can be applied to your workout. Maybe in this case you select a trail without mile markers (or just don’t pay attention to them). Instead of approaching the workout as a standard tempo run, the new assignment is to increase the pace over the second half of the run. No specific speed is needed, just faster than the first half. So if you need to run 6 miles for the day, the first three would be at a standard easy pace and the last three would be faster. How much faster? That’s totally up to you. The goal changes from a specific pace that is maintained to a pace that is simply faster than when you started. Ultimately you are getting in a similar amount of work, but hopefully because of the reduction of stress, your success rate for having a good workout has increased. Cross country running may even help reduce your chances of overuse injuries. Most of us realize that running is repetitive. Running on a paved path or sidewalk is very repetitive. Your muscles (large and small) move in a similar fashion step after step. If a muscle imbalance exists, and those muscles are used in the same fashion over and over again, the risk of an injury related to that imbalance goes up. So next time you head to the local park to hit the paved path around the perimeter, skip the path and run rampant in the grass. Make up your own cross country course as you go. Slalom the trees, jump over a park bench (well maybe start with a small bush…smile) and aim for the hills. The inconsistencies in the terrain cause your muscles to work differently for every stride you take. The repetitive effect is reduced because of variations of muscular movement due to differing surfaces and a multitude of movements (up, down, left, right, etc.). So there you have it. Not training for a cross country race, no problem! There could still be some merit in leaving the consistent and measured venues we typically gravitate towards. Who knows, maybe you’ll “fall in love with running” in a new way.